Custom Kitchens and Bathroom not only customizes your kitchen to reflect your taste and functional requirements. But we also design and build kitchens with your budget in mind. We have built many kitchens over the last two decades - catering for every sort specification and budget. We therefore have the experience and the 'know how' to keep the costs down on your kitchen project - by assisting you in choosing the right materials for the job. 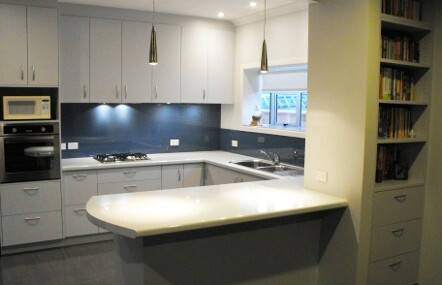 We also have the skills to ensure that your kitchen installation still meets the highest standards in workmanship. With wise decision making from the initial design stages of a kitchen project - a kitchen budget can be greatly reduced, whilst quality is maintained. So for just a little more outlay than you would invest in a DYI kitset kitchen - you could have your kitchen custom built by a professional to your unique requirements, and without compromising quality. Let us know your requirements, and we will affordably meet them.